Given that Switzerland is a small open economy and net exports contributed positively to growth in 4Q17, this pessimistic view is probably due to US President Donald Trump’s protectionist policies. Contrary to the EU, Switzerland is not exempt from the new 25% tariffs for steel and 10% for aluminium. After slow GDP growth (1.1%) in 2017 with a buoyant second half, Switzerland started 2018 on a strong footing. If the pessimism subsides, we believe the Swiss economy should grow by 2.1% in 2018. Swiss national accounting recently started to reveal the effects on GDP of large sporting events, such as international soccer competitions and the Olympic Games. They result in the sale of TV rights and increase the revenues of entities (like the FIFA and IOC) domiciled in Switzerland. This kind of events gave a short-term boost to GDP growth each time they occurred. In 2018. The effect is estimated by the KOF institute to add 0.3 pp to GDP growth. 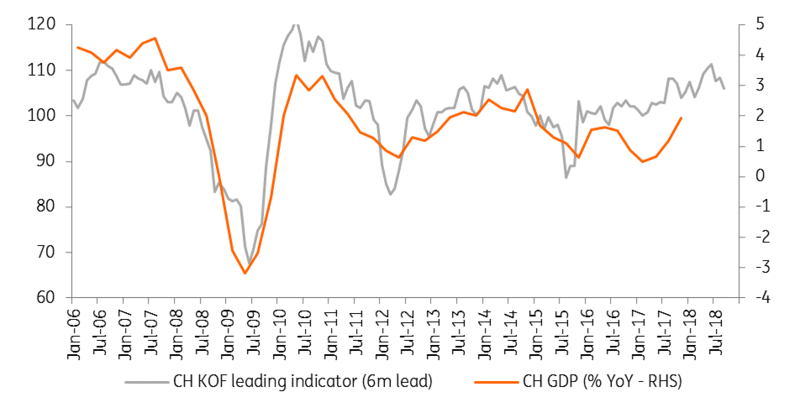 For the second half of 2018, we expect the Swiss Franc (CHF) to further depreciate against the EUR which is likely to increase the profitability of export-led companies, especially as we expect the Eurozone to continue to post strong growth figures in the second half of 2018. However, protectionist policies could seriously harm their performance too. In this context, we don’t expect the Swiss National Bank to hike interest rates before the ECB does so, which in our view would not happen before the second half of 2019. All in all, we expect a strong first half of 2018 and a somewhat slower growth rate in the second half. Inflation should stay low and well below the SNB target at about 0.8% in 2018.